This entry was posted in Newsreel on February 5, 2018 by ellie.s. SOUTH POINT — Classes may have been canceled across the region on Thursday, but students and faculty of Lawrence County’s newest public school still showed up in the evening to promote what their campus has to offer. An informational meeting took place at the STEM+M Early College High School in South Point, giving parents and prospective students a chance to find out more about what is available by the programs there. Director Jayshree Shah and lead teacher Alicia Spears met with parents and gave them an overview of the science, technology, engineering, math and medical education at the school. It currently has more than 50 students enrolled, beginning at the ninth grade level. While the educators met with parents, potential students went to the room next door and took part in a design challenge and program put together by the school’s current students. A string was stretched across the room and attendees were asked to construct a cable car from a balloon and other items. “They’re trying to make it move from one end of the room to the other,” Olivia Sites, a student from South Point, said. Trace Davis, of Chesapeake, who plans to enter the field of medicine, said the idea was for the constructions to sustain momentum. “They can give it a little push and that’s it,” he said. Both said they have enjoyed their experience at the school since it opened in August. While the initial designs did not make it across the room, student Anna Holman, who was running the challenge, told them not to be discouraged. In addition to the design challenge, the students also played a video of the Green City, a project STEM+M students worked on and completed in the second nine weeks of classes. They were asked to design a model of a sustainable city, which was energy efficient and climate controlled. As a non-Newtonian fluid, the Oobleck has properties of both a liquid and a solid, depending on how much pressure is applied to it. Parent Tammy Baily spoke of the experience her daughter, Leah Baily, has had at the school this year. Only halfway through her ninth grade year of school, Leah has already completed all of her ninth grade work and will spend the remainder of the year doing 10th grade, she said. In 10th grade, she will complete the remainder of high school requirements, wrapping up 12th grade by the end of that year, freeing her up for other opportunities in her junior year. “Her last two years in high school, she’ll be shadowing doctors at Marshall University,” Tammy said, adding that by the time Leah graduates from the STEM+M school, she will have completed college courses and have earned a two-year associate’s degree. This will allow her to go straight into med school when she gets to college. Tammy said Leah would also serve as delegate to the Congress of Future Medical leaders in Lowell, Massachusetts in June. She said the school had been a challenge for her daughter, who had “become bored” with traditional school. She said while it is more work-intensive, the benefits are clear. “This place is just able to push them out there for so many opportunities,” she said. There has been much discussion nationally about how to lure girls into STEM education and fields that have been traditionally dominated by boys. Shah said the current breakdown at the school is about a 50/50 split between the genders. She said the technology and engineering programs have been of more interest to boys, while the medical program is comprised more of girls. Shah said those studying are not interested in lower positions in their field. “They’re wanting to be doctors and physicians,” she said. Holman had nothing but good things to say when relating her experience at the school. In her junior year, she said she had experienced “negative interactions with students and staff” at the middle and high schools in the county she attended prior to enrolling at the STEM+M school. “Students were not treated equally,” she said, stating her concerns had been “ignored” when she had filed complaints. Coming to the STEM+M school after a year studying abroad as an exchange student, she said the environment could not be more different. Holman credits the system put in place by the school, in which students are split into “elemental groups,” rather than grades, as playing a big part in the improved environment. She also said the staff has been extremely receptive to student concerns. “They go out of their way to help you,” she said. “The extra effort is made. Shah said more informational meetings are planned for the remaining months of the year, set for 7 p.m. at the school on Feb. 12, March 8, April 12 and May 10. In addition to the STEM+M school, students in Lawrence County have another option for STEM education. The unaffiliated Project Lead the Way program, coordinated by Collins Career Center, offers classes in most of the county’s high and middle schools. Destiny Umbarger, a sophomore honor student at Boone Central of Albion will be a Delegate to the Congress of Future Medical Leaders in Lowell, MA, June 25-27, 2018. The Congress is an honors-only program for high school students who want to become physicians or go into medical research fields. The purpose of this event is to honor, inspire, motivate and direct the top students in the country who aspire to be physicians or medical scientists, to stay true to their dream and, after the event, to provide a path, plan and resources to help them reach their goal. Destiny was nominated by Dr. Mario Capecchi, winner of the Nobel Prize in Medicine and the Science Director of the National Academy of Future Physicians and Medical Scientists to represent Nebraska based on her academic achievement, leadership potential and determination to serve humanity in the field of medicine. This entry was posted in Newsreel on January 19, 2018 by ellie.s. Athletic accomplishments: One of the best players on the area’s top-ranked basketball team, Elaina averaged 16.3 points, 14.2 rebounds, 3 steals and 1.5 blocks in December. She had 25 points and 21 rebounds in the Times-Dispatch Invitational Tournament championship game against Highland Springs, and she was named the tournament MVP. Only a junior, she already has the school record for points scored in a career. Academic accomplishments: Elaina won the National Academy of Future Physicians and Medical Scientists award of excellence. She’s also been named to the Headmaster’s List each quarter. Medfield’s Boy Scout Troop 89 members Stephen Daniel Williams, Garrett Theodore Gipson, Robert A. Raine and Tyler James Hatch were honored at their Eagle Court of Honor on December 2 at the United Church of Christ in Medfield. Family, friends and many members of Troop 89 attended this event, recognizing these young men for their significant achievement. Attaining the rank of Eagle is rare; only 5 percent of all Boy Scouts do so. To earn the Eagle Scout rank, the highest advancement rank in Scouting, a Boy Scout must fulfill requirements in the areas of leadership, service and outdoor skills. The fact that a boy is an Eagle Scout has always carried a special significance, not only in Scouting but also as he enters higher education, business or industry, and community service. • A Scout must earn 21 merit badges, 13 of which are required. • A Scout must serve actively in a troop leadership position for a period of at least six months. • A Scout must plan, develop, and carry out a service project worthy of an Eagle Scout. • A Scout must appear before a Board of Review of prominent persons to demonstrate that he has done his best to understand and to live up to the Scout Oath and Law and in all ways has qualified as an Eagle Scout. Tyler joined Troop 89 in 2013 at age 11, when he crossed over from Webelos, Pack 200 and now stands before the community as an Eagle Scout. On his trail to Eagle, Tyler earned a total of 34 merit badges. He successfully completed Junior Leadership training and demonstrated his leadership ability within Troop 89 in the capacities of Assistant Patrol Leader, Patrol Leader, Assistant Senior Patrol Leader, Senior Patrol Leader and Troop Quartermaster. Tyler is a member of the Brotherhood of the Order of the Arrow. Tyler’s Eagle Scout Service Project created a serene place at the historic Grist Mill on Kingsbury pond where Medfield could memorialize its soldiers who are considered missing in action. The project included the removal of poison ivy, over growth and other debris and the installation of granite bench during a ceremony commemorating two of Medfield’s brave who never returned home. Tyler is a member of Medfield High School class of 2020 where he is a member of the baseball team and has been part of the Middle School and High School Ski Club for the past three years. Outside of school Tyler’s activities include playing indoor soccer with his friends, and working at the Metacomet Concession Stand that he helped design, refereeing soccer games, and is a Peer Leader for the Middle School Youth Program at United Church of Christ in Medfield. He was recently selected as a delegate representing Medfield High School and the Commonwealth of Massachusetts at the Congress of Future Medical Leaders. The Congress of Future Medical Leaders is a highly selective national program honoring academically superior high school students dedicated to the service of humanity through medicine. Tyler enjoys camping and family vacations. His hobbies include skiing and coin collecting. Stephen, Garrett, Robert and Tyler have demonstrated their capacity and willingness to exert leadership ability in the activities that are constructive and worthwhile in this community. They demonstrated ability to live up the 12 points of the Scout Law as well as to the Scout Oath, duty to God and Country, to others, and to themselves. As such, they qualified to receive the rank of Eagle Scout. An Oak Glen High School student has been invited to the national Congress of Future Medical Leaders. 15-year-old Nicholas Rawson earned the recognition for posting consistently high grades, as well as his interest in the medical field. “I just like to help people in general, and just help them with anything that I can honestly help them with – if I’m able to help them,” Rawson said. Rawson’s family is posting an online fundraiser with a goal of $2,600 to help him get to Boston for the 3-day conference that meets in June. Anyone interested in donating can go to their GoFundMe page. FLETCHER, OK (KSWO)-A local teen will be headed to Massachusetts this summer for a program aimed at inspiring our future doctors and scientists and helping them reach their goals. Riley Anne Heitz, a sophomore and honor student at Epic Charter School of Oklahoma who’s from Fletcher was chosen to attend the Congress of Future Medical Leaders near Boston in June. The event is for honor students planning to become physicians or enter the field of medical research. It’s helps them reach their dream by providing a path, plan and resources. Heitz was nominated by Dr. Mario Capecchi, a winner of the Nobel Prize in Medicine, based on Heitz’s academic achievement, potential and determination to serve humanity in the field of medicine. Brightney Varghese and Jarrett Lash, seniors at Osbourn Park High School and Patriot High School respectively, were among only 68 students selected nationwide to attend the National Town Meeting on Tomorrow (NTMOT) held last fall in St. Louis. The students were selected through the Youth Salute Program to represent Prince William County. At the closing awards ceremony, Lash was recognized as one of the top 12 finalists for the National Youth Leader of the Year and awarded a financial scholarship. During the four-day conference, students dialogue with proven adult leaders, broaden their horizons by interacting with youth leaders of diverse backgrounds, enhance leadership skills with seminars by dynamic professionals and national political leaders, and participate in small group experiential learning opportunities. Varghese and Lash said the students openly discussed a variety of issues, including wealth disparity, racial oppression and educational disparity. They also had an opportunity to tour Washington University in St. Louis. Varghese said she learned that sometimes it is hard to complete group activities when everyone in the group is a leader. “Now, whenever I am in a group setting, I make sure there is equal participation and allow everyone to voice their opinion,” she said. Lash said he developed a more profound understanding of the impact of educational disparity and how it affects society. He said that after talking with students from across the country, he feels like he has received an excellent education in PWCS. “This is a world-class education we are getting here at Patriot High School,” he said. Lash previously attended Glen Kirk Elementary School and Gainesville Middle School. He also attended the Governor’s School @ Innovation Park before earning an internship at NASA Goddard Space Flight Center, where he studied electromagnetic satellite thrusters. Lash, a busy student, participates in VEX Robotics, SeaPerch Underwater Robotics, Science National Honor Society (president), National English Honor Society, Social Studies Honor Society, and All-District and All-County Bands. He is an Eagle Scout and has earned several awards at the state and national level in Precision Air Rifle and Smallbore Rifle competitions. Lash has earned an appointment in the U.S. Coast Guard Academy, following in the footsteps of his older brother, father and both grandfathers, all of whom served in the military. He said he is open-minded about what he might do upon graduating from the Academy. Varghese attends the Governor’s School @ Innovation Park and served as the vice president of her junior class. She is a religious education teacher and was a delegate at the Congress of Future Medical Leaders. She is a member of the National Honor Society, National Math Honor Society, National Spanish Honor Society, Medical Club and Key Club. She plans to major in biomedical sciences at a four-year university. With a future in medicine looking likely, St. Francis High School junior Yashmita Malhotra has been selected to be a delegate to the Congress of Future Medical Leaders in Massachusetts this June. The El Dorado Hills teenager was nominated by Dr. Robert Darling, the Medical Director of the National Academy of Future Physicians and Medical Scientists, to represent California based on her academic achievement, leadership potential and determination to serve humanity in the field of medicine. The Congress of Future Medical Leaders is an honors-only program for high school students who want to become physicians or go into medical research fields. The purpose of the three-day program is to inspire and direct top high school students in the country who aspire to be physicians or medical scientists. The students will hear Nobel Laureates and National Medal of Science winners talk about leading medical research; be given advice from Ivy League and top medical school deans on what to expect in medical school; witness stories told by patients who are living medical miracles; be inspired by fellow teen medical science prodigies; and learn about cutting-edge advances and the future in medicine and medical technology. The academy offers free services and programs to students who want to be physicians or go into medical science. For more information visit futuredocs.com. 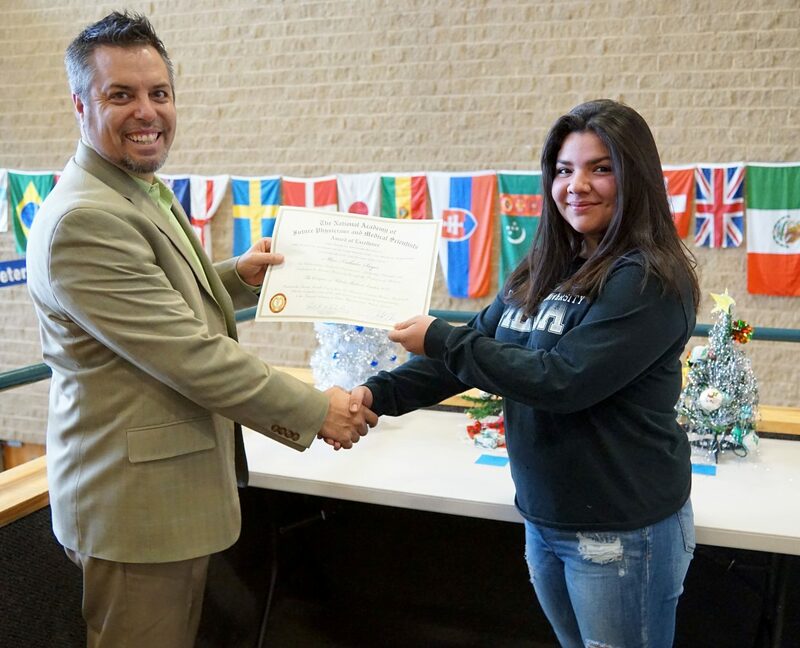 Moffat County High School Principal Kyle York congratulates Hali Reyes for recognition she received from the Medical Advisory Broad of the National Academy of Future Physicians and Medical Scientists. CRAIG — Changing the world begins with a single step or, for one local high school student, a trip to Boston. “I only have a year and half of high school. … I have to buckle down and figure out where I’m going to go to college and how I’m going to benefit people and change the world,” said Moffat County High School Junior Hali Reyes. On Dec. 15, Reyes’ 17th birthday, she was recognized with a certificate of “honor and distinction” from the Medical Advisory Broad of the National Academy of Future Physicians and Medical Scientists. High school counselor Paula Duzik nominated Reyes to attend the Academy’s 2017 Congress of Future Medical Leaders, held in Lowell, Massachusetts, in June. At the congress, thousands of students with an aptitude in science gathered to be inspired by positive messages about science and to gain “the direction, confidence and capabilities to stay true to their dream of becoming doctors and medical scientists,” according to the website for the 2018 congress. Becoming a forensic pathologist is Reyes’ current career goal. She was originally worried about the cost to attend the congress. Ultimately, the entire Reyes family traveled to Boston together. “And, her dad went with her to the congress. It was really fun to ask them what stood out in their minds,” Dunkley said. Hearing from the woman who received the first full face transplant and her doctor, as well as “a little kid that developed tabs for detecting colon cancer,” made an impression, Reyes said. The conference was eye-opening, as was the city of Boston. They visited Boston Square, went whale watching, toured museums, walked downtown and rented a car and drove around. “Woo, they are crazy. It’s a lot different, even compared to Denver,” she said. Boston is a place Reyes had wanted to visit for a long time. “My sister had open-heart surgery when she was little, and she had it there. So, I’ve always wanted to go and see the ocean and talk with people with their weird accents and see a city with so much history and talk with people that could give you so many historical facts,” she said. A gifted and talented student, Reyes is a member of student council and plans to run for school president next year. She’s also a part of Link Crew, Future Business Leaders of America, DECA and Honor Society. She also plays high school golf and is a member of the volleyball team. The National Academy of Future Physicians and Medical Scientists presented an Award of Excellence to Rejeah Cutliff, a senior and honors student at Plainfield High School. 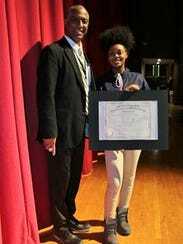 Cutliff received the award from Dr. Phillip Williamson, school principal, during an honors assembly on Dec. 14. The assembly recognized more than 400 Plainfield High School students who attained the highest grades during the first marking period. Copyright © 2014 - All rights reserved.